Episode #6 - Miss your DVR yet? Choosing the best "box" for cutting the cord! Like many of you, I've become addicted to the features of my Digital Video Recorder (DVR). I first got one of these beauties years ago back when Tivo was first getting popular. At the time I was a Direct TV subscriber and loved the fact that I could record two programs at once. Later, when HD arrived, I switched over to Cable for a variety of reasons. I appreciated that they "gave" me (rented is more like it) a similar DVR which could record in HD. The years passed and I became more and more frustrated that the features in my Cable DVR never improved (and yet the prices increased). This story should sound familiar to many of you! Nevertheless, if cutting the cord meant living without a DVR it would be a tough sell indeed. Fortunately, that isn't the case. Also, the point I like to make is that cutting the cord is about taking advantage of both free broadcast TV (if you can) and Internet video. The two services combined really do make a compelling alternative to Pay TV. To fully enjoy either service (and more), you will need much more than a simple DVR. Not everyone's requirements or needs are the same, so let's go over some of the features that you might look for in a "box" that would help you cut the cord! What kinds of boxes are there? One of the advantages of improving technology is that many of the features that used to require a separate box can now be integrated into another device (such as a traditional TV or BluRay player). I'm sure manufacturers love that they can incorporate compelling new (and/or exclusive) features into their TVs, but be careful as there are definitely some huge drawbacks for us. At least in the case of TVs (and some BluRay players), these are not cheap purchases. The two main disadvantages of this approach are that they become obsolete more quickly and they encourage vendor specific lock-in. You may also find that the features integrated into your TV aren't nearly as nice as what can be had in an external box (which can be more easily upgraded or replaced). For example, just because a device can do "Netflix Instant Streaming", doesn't mean it does it in the same way or with as nice of a UI. See my blog post here about that surprising result. Nevertheless, we can't ignore this category and a single smart TV may be all that some people are looking for or need (especially if you are in the market for a new TV anyway). Besides TVs and BluRay Players, you can buy a variety of stand alone boxes. Closest to a traditional DVR would be boxes from Tivo. There are also Internet only Media streaming devices from Apple, Boxee, and many others. What to look for in a "Box"
Let's ignore what the "Box" looks like for a moment and just talk about what we want it to do. If you have switched to broadcast TV (or are using unscrambled Cable), you will want traditional DVR features. This means being able to record (and play) HD signals. Also, most people would appreciate at least two tuners for recording programs simultaneously. Secondly, many people look for Media streaming capability as well. The box should play a wide variety of Internet video sources like Netflix, Hulu Plus, Amazon VOD, iTunes, Youtube, etc. Play traditional disc media like BluRays, DVDs, CDs, etc. Play movies on removable media like flash drives, etc. Be quiet and use very little power when not in use. Hint: This list might look suspiciously like what my Media PC can do. So far I haven't found a better box (for me), but that doesn't mean it is the perfect solution for everyone! Finally, if you have a family (or large home), you probably have more than one TV in your house. Traditionally (with Cable TV), you might have a cable wire run to more than one location to make adding TVs easy. Satellite TV is more difficult to deal with, but it is basically the same. So, if you are going to cut the cord from pay TV, you need to think about what you are going to do for those other rooms in your house. Does this mean you need to buy one "Box" for each room? If you rely on a smart TV does this mean you need all new TVs for each room? (I know which answer TV makes want to hear!). I've blogged more about the multi-room issue in detail here. There is a seeming endless list (and growing) of devices that fill some of these needs. Having spent quite a bit of time looking at them I'll share with you some of my overall observations. Many of these boxes fall into a just a few categories. The broadest category are (mostly smaller) manufacturers that aren't strongly affiliated with major content providers. You'll find that these boxes try to offer up lots of Internet content and give you the impression that you can have it all for free. I would place Boxee, xTreamer, Popcorn Hour and others into this category. I'm personally skeptical of the longevity of these solutions because the content provides (movie studios, etc) are constantly cutting deals with specific box makers to try and squeeze out the competition. On the other hand you have major players (Netflix, Apple, Amazon, Sony, Walmart, Roku etc) that have strong content deals/affiliation and are in constant warfare with each other to get the most and/or exclusive content. There is also the largely ignored category of feature enhanced DVRs made by Tivo and others. Strangely enough, it appears to me that Microsoft has been taking a pretty low profile in all of this even though they have a very good solution (IMO). Ah, the million dollar question! Unfortunately, I can't answer that as there are so many different things that people might want. If for example you only want Netflix you might be happy with a Roku , PS3 , Wii or Xbox . If you watch tons of Internet content and want a simple solution check out xTreamer , Boxee , Popcorn hour , etc. Or, if you are lucky, your latest TV/BluRay player might already have enough of what you need. If you are more adventuresome and "want it all" you might go for a Media PC as I have done. Note that when I first thought about this article I was planning on listing the pros and cons of many of the Media Streaming boxes available today. I quickly realized that there are a couple of problems with this approach. First, I couldn't possibly do justice to even the major ones without making this article way too long to read (and write!). Second, things change so rapidly that it gets out of date too quickly. Instead what I've focused on are the steps that I went through in choosing my solution and what I've learned in the process. I certainly have come to realize that there is a wide range of solutions available. It is all too easy to get overwhelmed and decide that this is just too complicated. In a way you are right, but some of this confusion is what makes cutting the cord viable. Pick a solution, try it, and I think you'll be surprised how easy it is to live without pay TV. I'll devote future articles to specific solutions (like Google TV), to give them the full attention that they deserve. 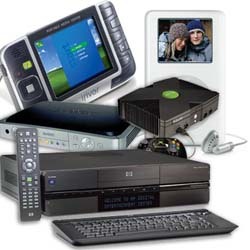 In the meantime, there is no shortage of devices to help you cut the cord and enjoy the savings!